FLA Orthopedics, Inc.6" thick neoprene with a soft nylon loop lining. Provides greater support with four lightweight spiral stays. Easy application with loop lock closures. Low profile design allows for maximum grip strength and finger dexterity. 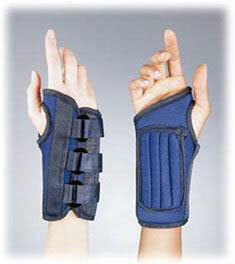 Provides soothing warmth to aching or fatigued wrists. Color: Navy. Specify right (RT) or left (LT). , 2881 Corporate Way, Miraman, FL 33025; Tel: 800-327-4110. Fax: 800-874-4117.